Restrictions on the use of A-boards on Chester’s streets are set to continue following a 12-month trial. Cheshire West and Chester Council launched strict new rules on the use of A-boards last January to help disabled or visually impaired pedestrians get around town easier – as well as to protect the appearance of the city centre conservation area. Since the trial began, only one A-board licence has been issued – and at a meeting on Monday, CWAC’s places overview and scrutiny committee recommended that the move is made permanent. Anne Rigby, from the West Cheshire Access Group, told councillors: “By their very nature, A-boards obstruct pedestrians from being able to move in a straight line along the pavement. “In my own experience I have had many collisions and trips over A-boards, and injuries to knees, legs and other things – and I am not the only person. 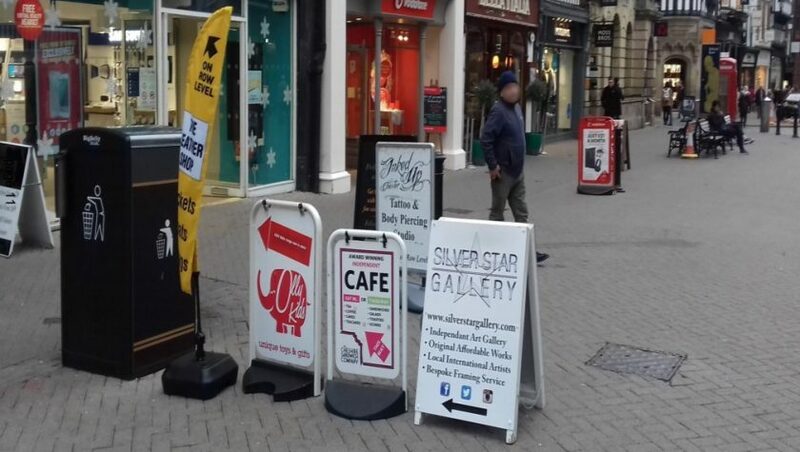 “Since the introduction of the current A-board policy, many disabled and older people have found navigating the city centre so much easier as a number of trip hazards and pavement obstacles have been much reduced. The policy allows businesses on the Rows, or without a frontage on a main street, to partner up and share an A-board – provided they have a licence. Regular enforcement operations have also taken place over the past year, with 30 unlicensed A-boards seized by the council on one occasion. Nick White, city centre manager at CH1 Chester business improvement district (BID), told the committee that he recognised there had been an ‘overproliferation’ of A-boards in the city. But he claimed that businesses were struggling with the lengthy application process – which consists of more than 50 questions and requires insurance documents for both businesses – and he fears small, independent businesses are being affected by the rules. Mr White said: “The reason I raise this is the number of applicants that have actually come in and asked for an A-board licence is very low. “One of the things that businesses tell me is that the process itself is over-complex. “To date there hasn’t be any successful application of two businesses doing that together [sharing an A-board]. The committee agreed that the A-board policy should be kept – but called on CWAC to look into improving the application form and work with CH1 Chester BID to consider alternative forms of advertisement for businesses. Cllr Karen Shore, cabinet member for environment, said: “I have visited the disability access group and I have also listened carefully to what the BID are saying. “I do think there are some things that we could probably look at to alleviate some of the problems that businesses are experiencing in terms of the application process and in terms of the requirement for shared boards. Members were also told that the requirement to share an A-board could be reconsidered – which would make the application process simpler.